From left, Caitlin Green, Ross Green, and Alison (Green) Kelly, three siblings who all graduated from Illinois State's School of Communication. They're seen here outside Fell Hall at Ross' commencement. The Greens came to Illinois State and could’ve picked any major, could’ve gone in one of hundreds of different directions with their careers—as siblings often do. But they didn’t. Today, all three are working in the TV news business, a shared passion that started inside Fell Hall and now fuels three promising young careers in broadcasting. 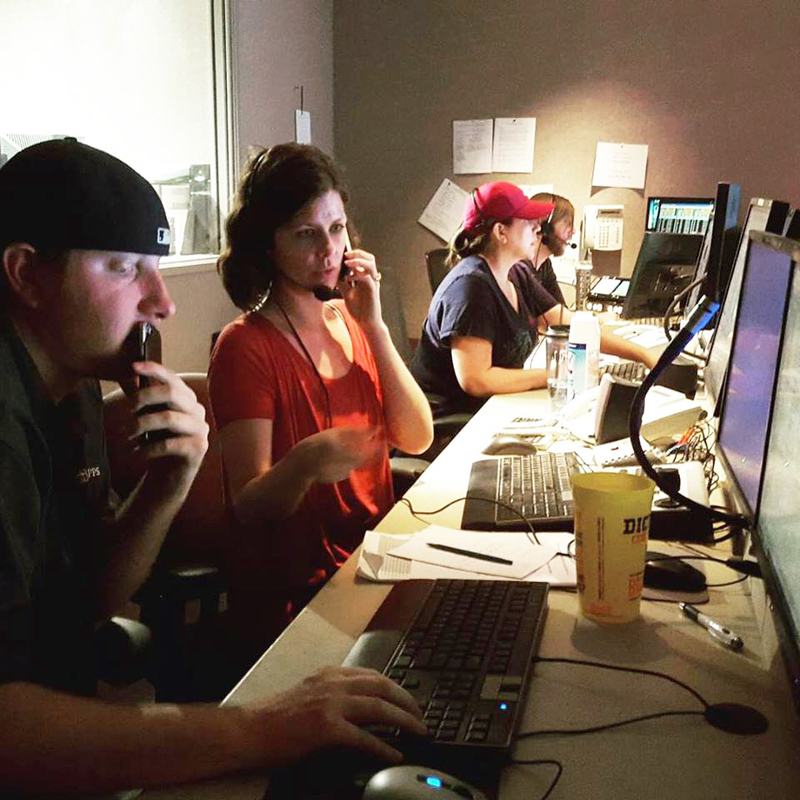 Alison (Green) Kelly ’03 is an Emmy Award-winning producer at the ABC affiliate in Phoenix. 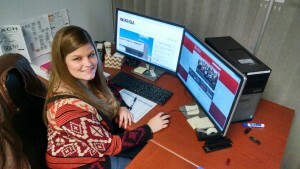 Digital director Caitlin Green ’09 recently joined KHQA in their hometown of Quincy, where her brother, Ross Green ’11, is the weeknight news anchor. All three are School of Communication alumni. 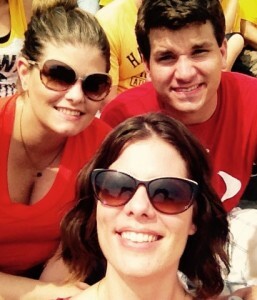 Alison, Caitlin, and Ross reunited this year for the Redbird football game at Iowa. All three say the School of Communication prepared them well for the unique demands of a career in TV news, even though what they do is so different—producing, on-air, and online media. Alison and Ross cut their teeth at TV-10, with Caitlin and her brother also working at WZND radio. “I don’t know how it all started, but I guess we were all born with the same love for speaking, organizing things, deadlines, and the horrible stress of the TV business,” said Ross, who started in sports in Quincy. Alison in the booth during preseason Cardinals coverage in August at ABC15. Indeed, none of the three can fully explain how and why they all went into the same field. Their dad works in insurance, their mom in retail. A few relatives are artists, but it’s not like they were spending their summers as kids in the garage making fake TV shows. Their careers really began at ISU. Alison came to Illinois State first. She knew she wanted to work in TV, maybe as a weather anchor. After trying her hand at every possible job at TV-10, she discovered her love of writing and producing. Related Video: Redbird siblings Meet Illinois State student-athletes Dalton and Jaelyn Keene. Caitlin and Ross overlapped at ISU for two years, and even worked at WZND at the same time. Now, Caitlin and Ross work 20 feet from each other in Quincy. Caitlin Green is digital director at KHQA. “We’re certainly no stranger to working in the same building,” said Ross. Working in the same field makes it even easier for the siblings to talk shop, swap work stories, and share inside jokes. The trio recently reunited to watch the Redbirds take on Iowa in the football season-opener. Occasionally, their jobs will intersect cross-country, such as a recent shooting of a 12-year-old in Quincy that led to a suspect’s arrest in Arizona. In that case, their two stations shared content for stories. Ross says the School of Communication gave him a well-rounded experience through classwork, WZND, and TV-10. Everything he learned prepared him for his first job in Quincy, he said.